Grapefruit’s bitter taste is caused by the presence of naringin, which is metabolized into naringenin. Researchers previously demonstrated in cell culture that naringenin can affect a cell membrane component known as lipoprotein mRNA so that less hepatitis c virus is released from the cells. If the findings in these studies extend into the clinic, naringenin might be prescribed to help patients clear hepatitis C virus. (JAMA April 2, 2008 vol 299 no 13 o 1532). Recent research shows that C-tactile nerve fibers, which respond to light touch, project into the brain’s limbic system and are responsible for the feelings of calm and wellbeing elicited by gentle manual stimulation (such as stroking). A review suggests that these findings are relevant to acupuncture. They may explain why even superficial acupuncture with brief needle insertion can have a clinical effect and why non-invasive sham acupuncture may not be a suitable control for clinical trials. (Role of C tactile fibers in touch and emotion - clinical and research relevance to acupuncture. Acupunct Med. 2006 Dec;24(4):169-71). Propolis may protect against heat stress in athletes, according to a Taiwanese study. The compound, made by honeybees from a mixture of resinous tree sap and wax, has a broad spectrum of biological activities including being anti-oxidant, anti-inflammatory and anti-viral, many of which are attributed to the active ingredient caffeic acid phenethyl ester (CAPE). The investigators examined blood from 30 competitive cyclists who had participated in endurance training for two to four years prior to the study. To examine whether CAPE had a protective effect against hyperthermia stress in athletes, they isolated peripheral blood mononuclear cells (MNC) and assessed their response to hyperthermia with or without CAPE pretreatment. Pretreatment was found to prevent or rescue MNC from hyperthermia-induced cell death, implying that CAPE might not only promote athletic performance but also prevent injury secondary to endurance-exercise-induced hyperthermia. (Caffeic acid phenethyl ester, an antioxidant from Propolis, protects peripheral blood mononuclear cells of competitive cyclists against hyperthermal stress. J Food Sci. 2009 Aug;74(6):H162-7). The Centers for Disease Control published data on the levels of 212 chemicals in 2400 volunteers in early August. Among other findings, the data indicates that over the past two years, levels of this antibacterial additive, which is commonly found in soaps, toothpaste, and other consumer items, have increased by 40%. In animals, triclosan can interfere with thyroid function, but this has not been seen in people as of yet. In fact, Sarah Jannssen of the U.S. Natural Resources Defense Council states, “we do not have any human data for triclosan”. The U.S. Food and Drug Administration will complete a safety review of triclosan in 2011. (New Scientist, Aug 14, 2010 p 6). The American Medical Association reports in its 2010 study that twenty per cent of bills submitted to private insurance companies are processed or paid incorrectly, wasting 15.5 billion dollars annually. Fourteen per cent of physician revenue is required to obtain payment from insurers. Rather than use an industry wide standard set of filing rules, each payer has a different and confusing set of rules, and there is no transparency or consistency in claim denials or errors. Another study published by a research scientist at Massachusetts General Hospital suggests that standardizing claim forms and rules would save 7 billion dollars a year. It would also save 4 hours of professional time per physician and 5 hours of practice support time each week. For The Massachusetts General Hospital, the study suggests that in 2006, the cost of excessive administrative complexity was nearly $45 million, or nearly 12% of net patient revenue. This represents $50,250.00 per physician. (Health Affairs 2010 April 29 (http://www.medpagetoday.com/PracticeManagement/Reimbursement/19844). A study of electro-acupuncture for chronic low back pain in horses has found that it can successfully alleviate thoracolumbar pain and that the analgesic effect persists for up to two weeks after the treatment. (Evaluation of electroacupuncture treatment of horses with signs of chronic thoracolumbar pain. J Am Vet Med Assoc. 2005 Jul 15;227(2):281-6). Medicare trustees have stated that projected reductions in the cost of Medicare are a result of the health system reform bill. These projections assume that physician payments will be decreased 23% on Dec. 1, an additional 6.5% in January 2011 and 2.9% in 2012. Economic reality dictates that when you pay for less of something, you will get less of it, so during the increased demand for medical expertise that an aging population and expanded government mandates will create, fewer physicians will be providing less treatment. (AMA). Cholesterol levels vary by as much as 20 per cent during the menstrual cycle according to a study of 259 women by the National Institute of Health. Researchers say these fluctuation should be taken into account when using these levels clinically. (Journal of Clin. Endocrin & Meta doi:10.1210/jc.2010-0109). A study of 22,576 diabetics with hypertension and coronary artery disease indicates that decreasing systolic blood pressure to less than 130 mm Hg does not reduce illness and actually raises all cause death rates, compared with accepting control at 140 mm or less. (JAMA 2010;304:61-7). A study has employed functional magnetic resonance imaging (fMRI) to explore the effect of flavanols from cocoa on the human brain. Sixteen healthy young women were given flavanol-rich cocoa to drink for five days and then asked to do a complex task while their brains were monitored using fMRI. There was a significant increase in blood oxygenation-level dependent (BOLD) signal in the brains of subjects who drank the cocoa, compared with subjects who did not. This may be due to either increased neuronal activity, or increased cerebral blood flow or both. The authors suggest that cocoa flavanols have potential in the treatment of vascular impairment in the brain, including conditions such as dementia and stroke. (The effect of flavanol-rich cocoa on the fMRI response to a cognitive task in healthy young people. J Cardiovasc Pharmacol. 2006;47 Suppl 2:S215-20). A new meta-analysis suggests that blood pressure (BP) responds favorably to cocoa, but not tea. For their study, the authors conducted a literature search for randomized parallel group or crossover studies evaluating the effects of cocoa products or black or green tea. They identified 10 studies that met their inclusion criteria. In the cocoa studies, cocoa consumption was typically via flavanol-rich chocolate in the range of 100g per day, while in the tea studies, consumption was in the range of four to six cups daily. In the cocoa studies, systolic BP and diastolic BP dropped in the active group (by an average of 4.7 mm Hg and 2.8 mm Hg) respectively), as compared with controls, however, in the tea studies, no differences were seen between the two groups. (Effect of cocoa and tea intake on blood pressure: a meta-analysis. Arch Intern Med. 2007 Apr 9;167(7):626-34). An observational study of the Kuna Indian tribe living on isolated islands off the coast of Panama suggests that a high intake of cocoa flavonoids can prevent death from a range of causes including heart disease, stroke, cancer and diabetes. Cause-specific death rates for 2000 to 2004 were compared between inhabitants of the mainland and the San Blas islands, where only Kuna live. The results showed that on mainland Panama, cardiovascular disease was, as expected, the leading cause of death (83.4 age adjusted deaths/100,000) with cancer second (68.4). In contrast, the rate of CVD and cancer among island-dwelling Kuna was much lower (9.2) and (4.4) respectively. Similarly deaths due to diabetes mellitus were much more common on the mainland (24.1) than on the islands (6.6). The Kuna drink a flavanol-rich cocoa as their main beverage, contributing more than 900 mg/day and thus probably have the most flavonoid-rich diet of any population. Unfortunately for chocolate lovers, most naturally occurring flavanols are removed during the processing of cocoa beans. (Does flavanol intake influence mortality from nitric oxide-dependent processes? Ischemic heart disease, stroke, diabetes mellitus, and cancer in Panama. Int J Med Sci. 2007 Jan 27;4(1):53-8). The traditional Chinese medical premise that anger provokes a rush of blood to the head has been proved by new research. Experiments in an American lab showed that blood flow to the brain increased significantly in people experiencing mental stress. Fifty-eight volunteers, half healthy and half suffering from high blood pressure were put through a series of tasks designed to cause mental strain, including recalling moments where they felt anger, reading and arithmetic tests. Ultrasound imaging showed that arteries in the brain dilated when volunteers became stressed, causing a rush of blood to the head. The researchers found that while mental stress caused carotid artery dilation and increased brain blood flow in all the healthy volunteers regardless of age, it produced no significant effect on those with high blood pressure. This lack of the necessary increase in brain blood flow during complicated mental tasks could affect a person's ability to think clearly. It is already known that inappropriate vasoconstriction, or lack of this dilatory reflex in response to mental stress, contributes to the development of myocardial ischemia in coronary heart disease. This new study raises concerns that failure of the arteries in the brain to dilate during periods of mental stress could increase the risk of having a stroke. (Cerebrovascular mental stress reactivity is impaired in hypertension. Cardiovasc Ultrasound. 2009 Jul 3;7:32). Acupuncture has been recognized as a valid method of treating animals by the American Veterinary Medical Association (AMVA). The AVMA's 2009 conference included lectures on the history and applications of acupuncture, as well as demonstrations of the technique on animals. The conference heard that the earliest record of acupuncture’s veterinary use dates back to an Indian treatise on elephant acupuncture in 3000 BC. However, the first American textbook on veterinary acupuncture wasn't published until 1994. Papers on chiropractic treatment for animals were also presented at the conference. (American Veterinary Medical Association. http://www.avma.org/press/releases/090711_complementary_med.asp). The Chinese belief that meal timing is important to health is being backed up by Western science. Animal experiments have revealed that the daily expression patterns of thousands of metabolic genes in the liver are more dependent on the timing of food intake than on the body's circadian clock, as previously thought. The results of the US study suggest that the times at which eating and fasting occur each day have a huge impact on metabolism and may explain why shift workers are more prone to metabolic syndrome, diabetes, high cholesterol levels and obesity. (Time of feeding and the intrinsic circadian clock drive rhythms in hepatic gene expression. Proc Natl Acad Sci U S A. 2009 Nov 25. [doi: 10.1073/pnas.0909591106]). 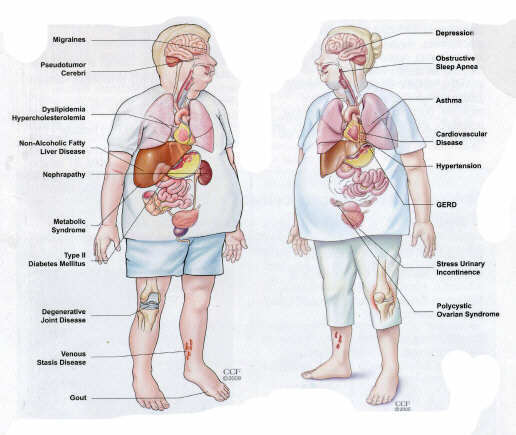 Aside from the rare situations that a medical condition causes weight gain, or the slightly more common situation where a drug treatment increases appetite or disturbs metabolism, physicians are no more effective in reducing obesity than anyone else. Help is at hand for the embattled at the front lines of medical practice. A front page article from the September 14th, 2009 American Medical News reveals how mainstream practitioners should prepare for the coming flu season. "Those who don't prepare will quickly be overwhelmed", said John Fontanesi, Ph.D. and professor of medicine at the University of California, San Diego.